I had to record a voiceover, so I dragged out three lavalier microphones for a quick test, plugging each into a Zoom H1 and recording a snippet of normal speaking. The results? 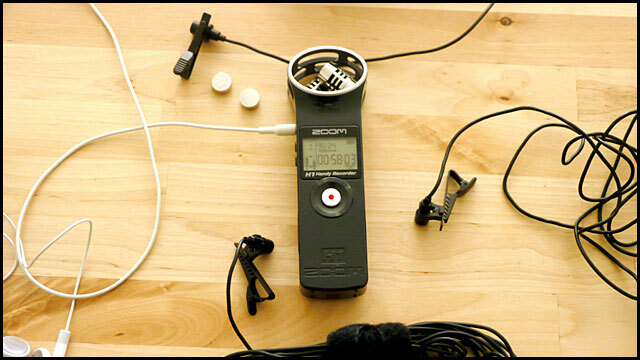 While the audio quality won't match a high-end microphone, the recording is fine for use in documentary interviews on location. That's not a surprise -- the 3350 is basically the updated replacement for the 35s. It's also essentially the same as the mic included in Audio Technica PRO88W-R35 Wireless Lavalier System with ATR3350mW Omnidirectional Mic, 170 MHz . You could post the audio somewhere else and just link to it. I use Blip.tv to host an audio podcast. I don't know if you can upload .wav files but .mp3 works well. That would work. The Voiceover itself is done, so I might post a sample from that as well. Panasonic GH2 Tele Conversion: Bagful of Primes?